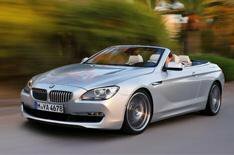 BMW unveils new 6 Series Convertible | What Car? BMW has revealed the first details of the new 6 Series Convertible. The new 2+2 soft-top is longer, lower and wider than the car it replaces, and will come with a choice of two turbocharged petrol engines. The most prominent feature of the car is its 'shark's nose', with a forward-slanted grille, broad air intakes, a wide, contoured bonnet and flared wheelarches. It all combines to create a wide wedge shape, which is accentuated by chrome parts such as the foglights. The electrically operated roof can be opened in 19 seconds and closed in 24, at speeds of up to 25mph. It also has fins at the side projecting onto the rear of the car, and is available in three colours. Even with the roof down, boot capacity is 300 litres, and the heated glass screen behind the rear seats can be raised and lowered separately from the roof itself. Although the new car is lower than the old model, BMW says it has more head- and legroom in both the front and rear, while the way the major controls are angled creates a driver-focused cabin. The seats are new lightweight units, and incorporate an Easy Entry function automatically sliding as far forward as possible at the touch of a button to make it easier to get in and out of the rear seats. Two engines will be available from launch: a 3.0-litre, six cylinder in the 640i (which comes with a stop-start system) and a 4.4 V8 in the 650i. The 640i hits 60mph in 5.7 seconds and averages 35.8mpg., while the 650i manages 5.0 seconds and 26.4mpg. The 6 Series will come with Dynamic Drive Control as standard, which allows drivers to choose how responsive they want the gearbox, steering and throttle to be. Among the options will be an Adaptive Drive system with electrically controlled shock absorbers and anti-roll stabilisation and an Integral Active Steering system, which steers the rear wheels, allowing for more manoeuvrability in town as well as more agility at faster speeds. Also available on the car will be features such as a head-up display, night vision with pedestrian recognition and parking assist, as well lane-change and lane-departure warning systems. In addition, drivers with a Blackberry smartphone will be able to integrate it into the car using Bluetooth. This will allow them to access their e-mails using the standard iDrive controller, and these can even be read aloud using a text-to-speech function. The new model will go on sale in March next year, and every version with come with leather upholstery, alloy wheels, an eight-speed automatic transmission, xenon headlights and sat-nav. Prices will be announced nearer the on-sale date.